BedGuard has received many customer reviews. See what they say . . .
BedGuard :Why did you choose BedGuard? BG: How many do you have in your facility? BG: What has been the best thing about the mattresses? PV: The improvement in quality of the product we are offering. BG: Has it helped to reduce laundry? PV: No-they are only on beds that have no linen supplied. BG: Has it made it less distressing for your residents / clients easier to manage? PV: The customers love it, as it feels like a normal bed, unlike the thin plastic mattresses they were supplied with previously. We have a 10 year old severely autistic son who still needs to wear incontinence products at night. Unfortunately, because of his size and active nature, these products still do not provide 100% protection most nights. Before bedguard I was using a Kylie mat plus a thick bulky mattress protector but often our son would get between the Kylie mat and the mattress leaving me with all the bed linen plus a wet mattress to deal with. As well, even though, I have a large capacity washing machine, often I found myself needing to do 2 loads of washing per day and during winter, the Kylie mat seemed to take forever to dry. A friend, who also has a son with autism, told me about bedguard so I got our son’s a mattress. For the first week I didn’t use any mattress protection opting only for a single fitted sheet. I felt that this product sounded too good to be true! I was determined to give it a “work out” early on and if I was not entirely happy I would demand a refund - Our son wet the bed 5 nights in this first week. I cleaned the mattress as instructed and finished with a baby wipe. I could not believe it – the mattress did not smell and it still doesn’t after some 4 months. For many years I had been paranoid about our son’s bedroom smelling like a public toilet and in turn spreading to the rest of the house. I would spent hours cleaning, disinfecting and drying the mattress. Now it was so easy and the amount of washing decreased dramatically. After our “rigorous” first week of testing, I decided to use a very thin cheap mattress protector however; this was now (thanks to bedguard) more of a personal choice rather than a necessity. I wouldn’t hesitate to recommend this product to anyone in a similar situation. At BedGuard, we pride ourselves on designing, manufacturing and delivering quality products to our customers. 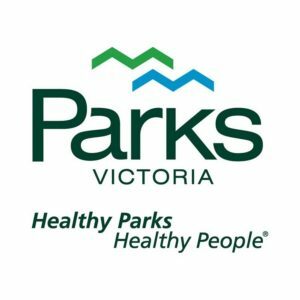 This has been recognised by CSIRO with an "excellent" rating. Our Founder and CEO, Peter Carey, invented the BedGuard Treatment when used with the proprietary Healthguard after recognising a clear need to improve mattress health. Mattresses are often exposed to a variety of allergens, contaminants and pollutants through everyday use. This is multiplied in cases where the occupier is young or elderly and vulnerable to bed wetting or incontinence issues, but also for people with disabilities, recovering from substance abuse or other health issues such as obesity. The BedGuard waterproof mattresses are constantly put to the test in a range of environments from shelters to nursing homes, bariatric patients to the everyday family home. Adding to a steady stream of positive customer feedback confirming the quality of mattresses, CSIRO also gave BedGuard an official stamp of approval. Excellent resistance to water penetration of surface. What does this mean? Quite simply it means that the BedGuard mattress does what it's meant to! 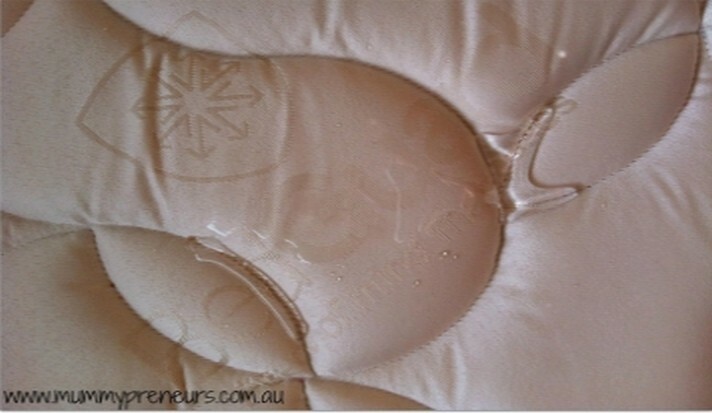 The BedGuard Treatment provides a barrier to liquids, providing quality waterproof mattresses, doona and pillow covers. To see the full report from CSIRO, click here. All BedGuard Waterproof Mattresses are covered by our 5 year guarantee. Check out more technical information here, and don't forget that all our products are proudly Australian Made. My little miss 2 (almost 3) was super excited to receive the new mattress for her new big girl bed. The BedGuard service was absolutely spot on. After being informed of the (very prompt) delivery time of my new mattress, I received a missed call and message from the delivery driver. I quickly rang back and was greeted by a friendly voice assuring me that the call was just a courtesy and that the mattress had been delivered as arranged. The mattress itself was comfortable, light (I was able to lift it and move it myself - an important quality for a single mum). Up until tonight there had been no opportunity to test the "guard" quality of the mattress - I was loathe to deliberately put our lovely new mattress to the test. However miss 2 obliged this evening when she decided to share her cup of milk with her baby doll who was lying on her bed. Leaving her milk tipped upside down next to baby doll was the the method she chose. Upon discovering milk everywhere I whipped off the sheet and mopped the milk with tissues (no paper towel handy). As promised the mattress repelled the liquid and it left no sour milk smell. I have nothing but praise for my experience of this product and company. 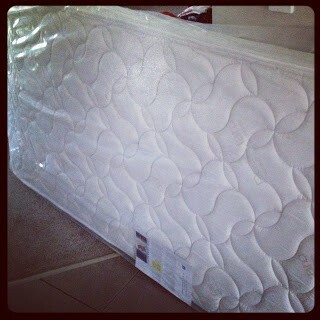 This is my Mr 6 looking very happy and pleased with his new BedGuard mattress. He has been sleeping in the mattress for 10 days now. When I asked him if he likes his new mattress he said "YES!" Is it comfy? Another "YES!" So, BedGuard passes the comfort test. My son was having accidents every night to every second night. What I feared most was the wetness getting through to the mattress. There is not much that can be done if that happens, and the last thing I want is a yellow stain, or an odour as a constant reminder that the bed has been soiled. Using Bedguard I felt more at ease because the mattress does not absorb the wetness. And the wetness is easily cleaned off without leaving any residue or stain. No odour is left to linger around either. According to the website this bed also repels bed bugs because it does not absorb wetness. That does provide peace of mind. My dealings with the company were also very pleasant and professional. I received contact straight away and delivery was organised promptly. I also received a courtesy call to let me know the delivery was on its way. I appreciate this because the last thing you want is to sit around all day waiting for a delivery. All mattresses are designed and manufactured in Australia so that's another tick. The webpage is informative and user friendly and purchases can be made online. Considering all the benefits of the bed, I thought the prices were also very reasonable. I would definitely recommend Bedguard to anyone considering purchasing a mattress especially for children or the elderly. 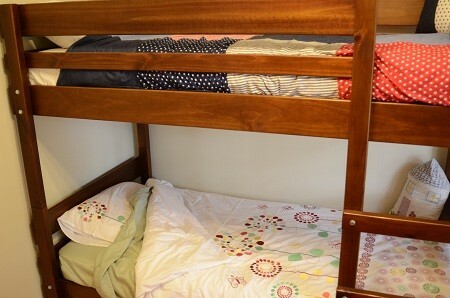 Or even for parents that have bedtime visitors or enjoy breakfast in bed. Thank you BedGuard and Kidspot for the opportunity to trial this great product. The previous manager choose Bedguard mattresses as it has easy upkeep, being able to use a baby wipe to keep them clean. 100% of our beds are Bedguard , 18 in total. The ease of cleaning is the best thing. 16/02/17 – Spoke to Vicky, said mattress is fantastic and he’s loving it. 10/10/16 Spoke with Anna the gentlemen who is sleeping on the 300kg rated mattress is sleeping better and Anna said its wonderful no complaints they are very happy with the purchase and the gentlemen is now sleeping all through the night. It is so easy to clean the mattress up and put a new sheet on! On the day I received a phone call from the delivery man who told me he was on his way! I love this kind of customer service, complete with happy friendly delivery. The website is very informative and easy to navigate through which is great when researching products like this! Thank you BedGuard for your wonderful service and product. I will highly recommend you to friends and family and I will definitely be back soon to get a new mattress for my daughters bed! I look forward to dealing with you again. Sometimes I receive quite unusual product pitches for my blog. Things that make me stop and think for a moment about whether I could write about them without being very cheeky. Sometimes I am offered items that come at the perfect time for us as well. This is one of those items. The lovely ones at BedGuard asked if we'd like to review one of their mattresses. They are quite a young company and were keen to know what some real families think of their products. This is the bit where I confess that two of the single beds at our place have been sporting those el cheapo foam mattresses and while the kids hadn't complained about them, having lain on them myself I knew they just were not much chop and we needed to do something about it. I had a knock on the d oor at 7.30 one morning and likely scared the wits out of the delivery guy with my pyjama clad bed hair ways as he brought in our new mattress. Immediately the boys decided it was for trampolining in the lounge room. Cheeky buggers. They were disappointed to realise that in fact it would be going straight on the Big Girl's bed frame. She's been sleeping on it for a week or so now. She is a sensitive soul my daughter, and prone to nightmares fairly regularly. I'm now wondering if her dodgy old mattress wasn't contributing to her restlessness a bit as she's not had one since the BedGuard mattress arrived and she is waking more refreshed as well. She is NOT a morning person so whether it is related or not, I am loving a little less snark from her in the mornings! She tells me she is much more comfortable and that's really the most important thing for me. If I'm not allowed to sleep then someone should be! Ironically she was the worst sleeper of them all as a baby, and only slept through the night consistently once she had started school. 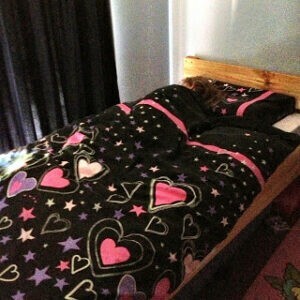 You can imagine how happy it makes me that I can count on her being well rested these days! So what makes BedGuard mattresses special? They have a unique protection system that repels liquid, odour, stains and bed bugs giving them a longer life than many mattresses as well as peace of mind for those of us with small people prone to being a bit wet or smelly sometimes. I can also share that for those who sometimes end up sleeping in one of the kids' beds because your own gets too crowded, they are really really comfortable! If you are due to upgrade the mattresses at your place I can happily recommend BedGuard, and assure you that after catching me first thing in the morning the delivery crew won't be at all put off by your bedroom attire either. You can also find BedGuard on Facebook and YouTube, and as a special offer just for Kate Says Stuff readers they are offering $30 off per mattress you order. Please email me for details on how to take up this offer. Disclosure: We received a BedGuard mattress for the purpose of this review. No payment was offered or accepted and all opinions are my own. And while I can't guarantee that a BedGuard mattress will solve all the sleep issues at your place I can assure you that the mattresses come with a 5 year guarantee, so that's a bit ace. The mattress has arrived and the young man is sleeping soundly. Thank you for your great service. Like for most other families the upcoming arrival of our new baby means a big bed(room) shuffle with miss 2 moving into a big bed to make room for the new addition. A decent single bed and mattress can be quite an expensive purchase and it is a long-term investment so you do want to get it right. The twins love their Bunkers Convert-a-Bunk and we do too so that made the decision really easy this time, the only thing we changed this time around was the mattress. Choosing a proper, good quality, durable mattress is very important and with prices starting at around $300 per mattress it is not something you want to have to replace often. Adults are (usually) quite good at keeping their mattresses clean but for children that is a very big ask, we all know accidents happen and there is nothing you can do to prevent that. If you have ever tried to clean, scrub and deodorize a mattress you know it ruins your mood, takes ages and after all that it never becomes 100% clean again. Here’s the good news, there is hope! The innovative new BedGuard mattress range takes the hassle out of a wet bed with its unique protection system that stops liquids, stains and odours from ruining your mattress. 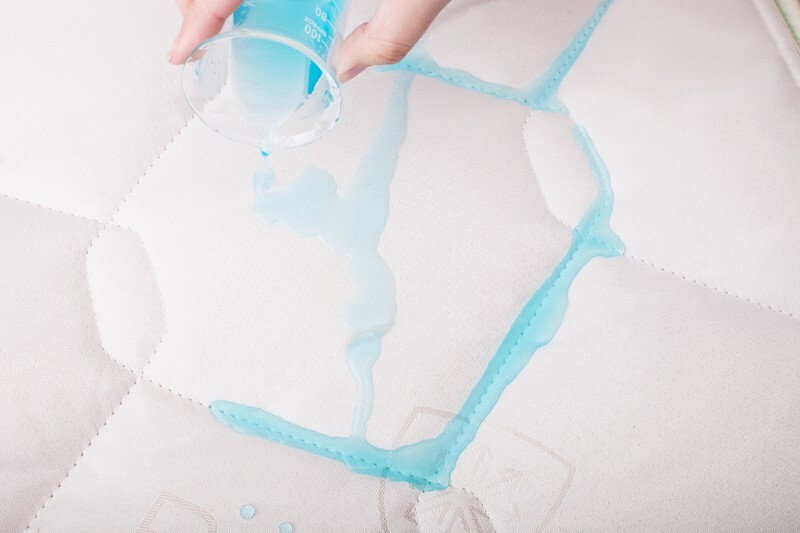 There is no need for mattress protectors (no more crunchy sounds and sticky plastic for your child to sleep on) as the special BedGuard protection layer keeps all the nasties at bay, in case of accidents just use some paper towel to remove the spill and your mattress is fresh, clean and dry again. Aside from repelling liquid, odours and stains BedGuard mattresses have many other great features that make them the ideal choice for your child. 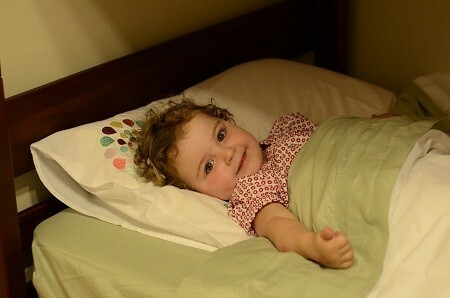 The anti-dust mite, anti-bacterial, bed bug resistant and flame retardant properties give parents peace of mind, they can sleep well knowing their child is safe and comfortable all night through. All BedGuard mattresses are filled with above industry standard foam density and high quality inner springs ensuring a comfortable night sleep. Within the BedGuard range you’ll find three different types of mattresses (Guardian Comfort, Guardian Luxury and Guardian Opulence) in all bed sizes so the whole family can enjoy the BedGuard peace of mind. Prices start at $330 for a single bed mattress which is very similar to what we paid for our other two single bed mattresses, except we did not get all these great features and still had to invest in mattress protectors too! Because of a little hiccup with our Bunkers order our two BedGuard mattresses arrived here long before the bunkbed did which really tested my patience as I was very keen to put them to test. Between you and I, during one of my restless nights as a pregnant woman I decided to try out one of the mattresses myself and I can guarantee you it was very comfortable, we might have to buy a queen size mattress too! By now the bunkbed and mattresses are all in use and last week we had our first (small) accident, not usually reason to celebrate but in this case the perfect opportunity to see if the BedGuard promise delivered. As per the care instructions I removed the sheets and put paper towel over the spill to soak up the liquid. I repeated this three to four times and after that the mattress felt dry, and no smell! No scrubbing required and no covering the patch in soda, no yellow stain and no sneaky odours that hang around. Super easy and a real time (and irritation) saver for busy mums like me. 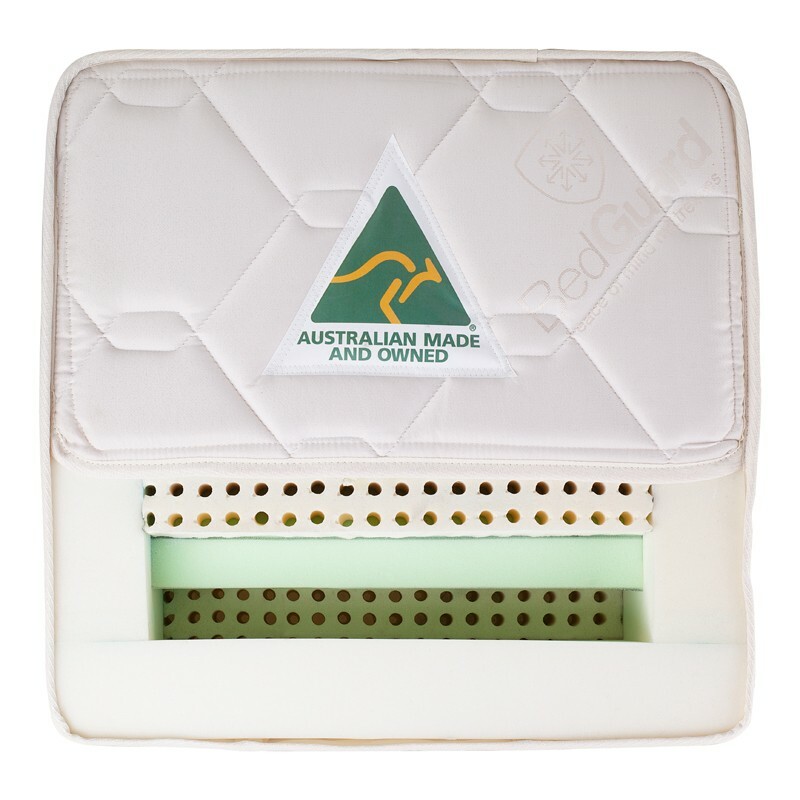 BedGuard is an Australian family business with all products designed and made right here in Australia using high quality materials. Being Australian made you can rest assured that the manufacturing process is closely monitored from start to finish to supply Australian families with an outstanding product that they can enjoy for years. BedGuard mattresses have a life expectancy of 10 years and a 5 year guarantee. Toddler toilet training. It’s a stage that can bring excitement and apprehension, pride and frustration – and up until recently a lot of sleepless nights. While my dear Cheeky Monkey is wonderful during the day, being a deep sleeper, it's easy for him to have little accidents - and not so little accidents through the night. Even despite having a waterproof mattress protector on his bed, more often than not the mattress would still get wet, which meant it wasn't as simple as changing the sheets, cleaning him up and putting him back to bed. Instead we'd have to clean the mattress and bring him in with us, which equates to 5cms of bed for me and very little sleep! The water just bubbled and stayed on the top of the mattress without soaking through. One quick wipe with a paper towel got it straight off – and the mattress was still completely dry. I was honestly amazed. Not only does it deliver on its promises to repel liquid, stains and odour, making it longer lasting and more clean and hygienic, it is also incredibly comfortable and meticulously made, making it the perfect first mattress for your little one. With no more frantic mattress cleaning in the middle of the night and no more sleeping on a tiny amount of bed with a restless toddler, I can highly recommend BedGuard. So whether you are looking at buying your little ones first bed, going through the toilet training years or need to upgrade a mattress, be sure to check out the BedGuard range and visit them on Facebook and YouTube. As a special offer for Adventures and Misadventures of a Mummypreneur readers BedGuard is offering $30 off each mattress you order - to take advantage simply email me and I will send you through the discount registration details. I remember vividly when Miss C moved to her big girl a couple of years ago. Picture a happy toddler one day in her cot, to literally the next day screaming and jumping up and down to get out of it. It was pretty obvious she was ready! I also remember searching arduously for her big girl mattress. I remember going to the bed shops and looking at what was on offer and how the mattresses varied in price, quality and how each sales person said that their mattress was the best. I believe in buying good quality mattresses because little ones spend a lot of time on them sleeping. Their growing little bodies should be supported properly and of course it should be comfortable. But boy!, can shopping for the right mattress be hard! For the last couple of months Sparky and I have been talking about how Miss S is now ready to move to her big girl bed. I dreaded the thought I having to find another mattress and had been putting the search off. I swear someone up there must have heard about the dreaded search because within in a week I received an email from the amazing team at BedGuard and I discovered a mattress that I wish I had know about years ago! 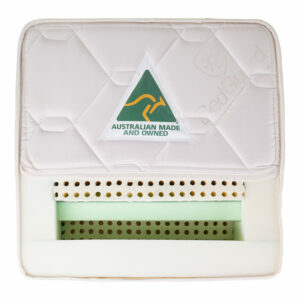 BedGuard mattresses are wholly Australian made and BedGuard are also 100% Australian owned. Fantastic right? but it just keeps getting better…..check out the mattresses! 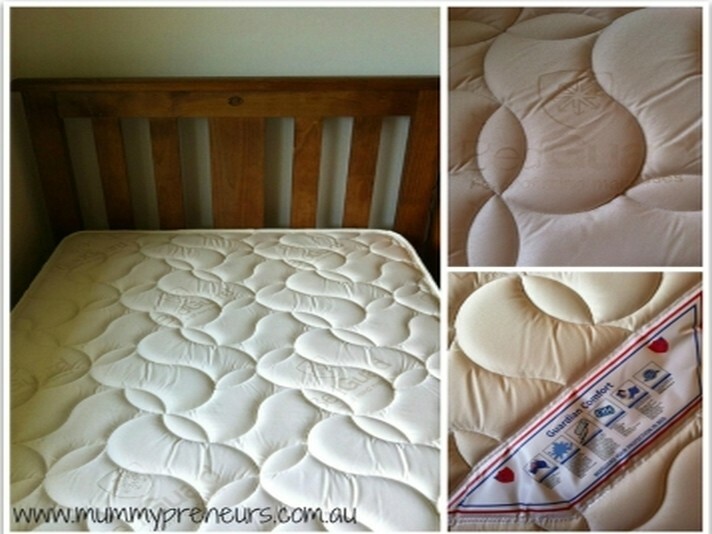 All BedGuard mattresses repel liquid – This is the most outstanding feature to me and it really, really works! I had to test it out and check out the picture below…. Miss S drinks her bottle before she goes to bed, so keeping liquid from soaking into the mattress is high on my want list. The liquid just beads. I poured water from her bottle over the mattress and you can see the results for yourself. I just soaked it up with some paper towel and like magic it was gone! The best bit was, there was no moisture left on the top at all, AT ALL! Amazing! Usually I use a mattress protector too, but you not longer need one with a BedGuard mattress. However in saying that, I will still use a quick removable Brolly Sheet for on top of the sheets during toilet training, as I don’t want to be changing all the sheets in the middle of the night! Repels Bed Bugs – As it doesn’t adsorb liquid and liquid can’t penetrate to the inner of the mattress there is no place for the little creatures to grow! are Healthguard™ protected providing an anti-bacterial and anti-dustmite sleeping environment and are non-toxic, double-sided and protected on both side (so I don’t have to remember which side I should use), filled with above industry standard foam density and high quality inner springs ensuring a comfortable night sleep. Lastly they are expected to last 10 years! That is so scary to think of Miss S as a 12-year-old and how old I will be! plus they have a 5 year guarantee. You can even check out how the mattress are made. I think it is an impressive video! It is a WOW of a mattress and Miss S has been giving it the ultimate test for the last couple of weeks and it has the seal of sleep approval. She has had a restful nights sleep every night. Wish I could say that for Miss C! So it is obvious I love our BedGuard mattress and with the prices being so competitive (plus it is delivered to my door!!) and packed with so many features, I know I will be definitely returning to buy another as soon as we need it. I can hear the Guardian Opulence in King size calling my name…….zzzzzzzz If you are looking for a mattress for your little one, definitely check out BedGuard. I am impressed and I am sure you won’t be disappointed. There are even more reviews and testimonials on the website of how much people love them. Plus BedGuard are giving Divine Finds readers $30 off any mattress! If you are looking to buy, just send me a quick email via the contact tab above and I will give you the code to save!You can find more out about BedGuard by visiting the BedGuard website, www.bedguard.com.au. You can also stay up to date and support an Australian small business by liking BedGuard on Facebook and finding their helpful videos on YouTube. Disclosure: This is not a sponsored post and no monetary compensation was provided nor offered. A complimentary BedGuard Mattress was provided for review and all views, opinions, impressions of how much I loved the mattress are my own, based on my personal experience with the review item.